The early modern period witnessed sometimes startling, sometimes subtle transformations in the religious and intellectual life of peoples across the globe. For reasons that varied widely, leaders and thinkers from Mexico to the Ottoman Empire and from China to the Indian subcontinent sought to reform existing religions, develop new spiritual practices, promote innovative texts, and, on occasion, even create new religions. 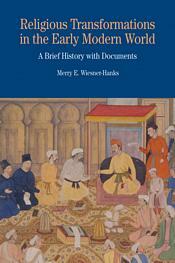 Presenting documents from different regions and different religious and philosophical traditions, including Islam, Judaism, Sikhism, Christianity, and Confucianism, this volume allows students to explore and analyze these varied transformations. A general introduction introduces the framework for examining the chapter case studies, while the chapters provide context, a group of primary sources, and a set of questions to consider. Useful pedagogic supports include headnotes to the documents, a chronology, a set of broader questions to consider that help students compare transformations, a selected bibliography, and an index. "This collection is a wonderfully innovative tool for teaching religion in early modern world history. The introduction offers just enough context to help students make sense of the selections. The best thing about this text is that it may gently provoke students to think very differently about the historicity of religious traditions. They've never been static, and many aren't that old. This book is sure to win converts!"